President Emmerson Mnangagwa with Kudakwashe Tagwirei at the burial of the businessman’s father, Sekuru Phineas Tagwirei, in May 2018. Vice President Constantino is on the left. The "non-partisan" 24-member PAC also includes newspaper businessman Trevor Ncube, owner of Alpha Media Holdings (AMH) which publishes Newsday and weeklies; The Standard and The Zimbabwe Independent. Econet's mobile money transfer subsidiary, Ecocash chief executive, Natalie Jabagwe is part of the group. Meanwhile, commenting on the new council, MDC-T deputy president Obert Gutu questioned the bloated number of Mnangagwa advisors saying this could be another avenue to haemorrhage the country's scarce resources through perks. 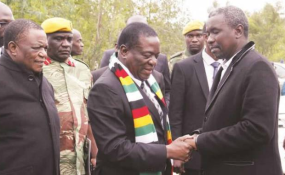 "I would think a smaller group of presidential advisors would be more appropriate," he told NewZimbabwe.com. "We also don't know their terms of reference. Are they paid a regular retainer fee or what? "This obviously has got budgetary implications and in the interest of transparency, the CVs of all members of the team have to be made public. We don't want another jobs for the boy or girls scenario." "Do they have his ear, can they change anything?" asked Mafume. "It's another group of people who will get fuel and other perks due to accessibility to the President."